Daxter Tristen Peel obituary. Carnes Funeral Home. 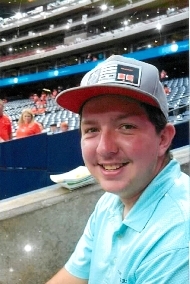 Daxter Tristen Peel, 22, of Bacliff, TX, passed away in Kemah, TX on the 15 th of November of 2018. Daxter was born at Memorial Southwest in Houston, TX on the 22 nd of May in 1996 to Felicia Escobar and Sean Peel. Eight years later, he met his Step-Father, Robert Schneider. He is a graduate of the 2014 Class of Dickinson High School and a member of the Dickinson Gatorzillas throughout high school. Dax worked for Walmart in Kemah, TX off and on for 3 years and loved to play games, both online and in person, and loved animals of all kinds. He was planning to start school to study marine biology this coming spring. Daxter is survived by his parents, Felicia Escobar, Sean Peel, and Robert Schneider, his brother, Nicholaus Peel, his sister, Rose Collins, his Aunt Kathleen Peel Brazeal, his maternal grandmother, Elinor Hernandez, his paternal grandparents, Betty Smith and Kelly Cumbie, his girlfriend, Chelsea Leigh Story, and his Great Aunt Julia Heckendorn and partner Sandra Murphree, Great Uncle Warren “Sonny” Heckendorn and Victoria, Great Uncle Tommy Cooper and Joan, Dian Hughes, numerous family members and friends, and was predeceased by his maternal grandfather, Felix Escobar, his paternal grandfather, George Peel, and his great grandparents, Joseph and Edna Martin. Visitation will be held at Carnes Funeral Home in Texas City on the 21st of November of 2018 from 9 to 11 am with service from 11 am to 12:30 pm.